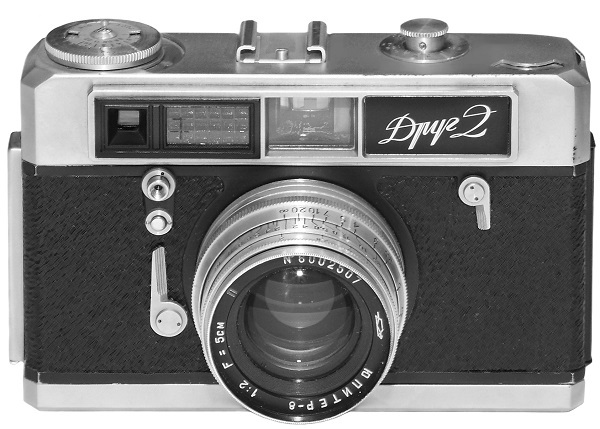 Prototype rangefinder camera, conceived by famous KMZ Chief Designer E.V. Solovjev and the young KMZ Designer A.S. Dorofeev in 1958. 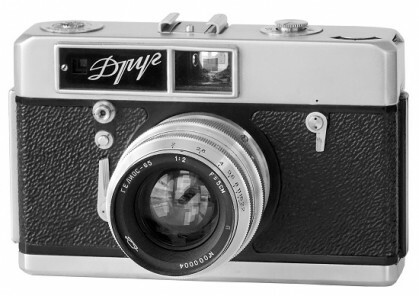 The camera itself has many unique features - the film cassette is loaded on the right side and the take-up spool is located on the left, the rewind knob is on the bottom, and the shutter release button is on the front of the camera, above the original design of self-timer lever. The Zorki-7 is very well made, the body is cast and rigid, the finish is much better than on other Soviet cameras of the same vintage. It's interesting to mention, that Zorki-7 was initially planned to have a selenium lightmeter (as on Drug-2 camera, see information below). 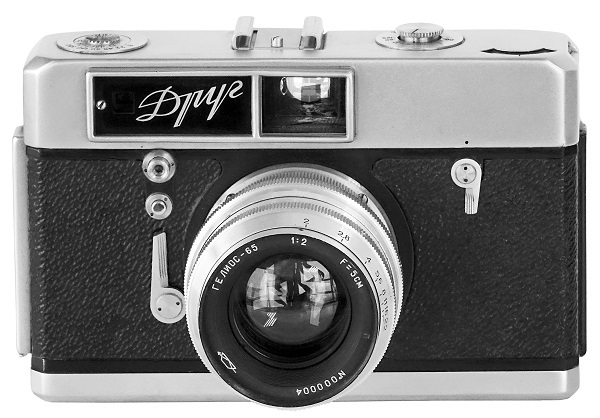 Fitted with prototype Mercury-1 2/50mm or regular Jupiter-8 2/50 mm lenses. An ultra rare to find nowadays! 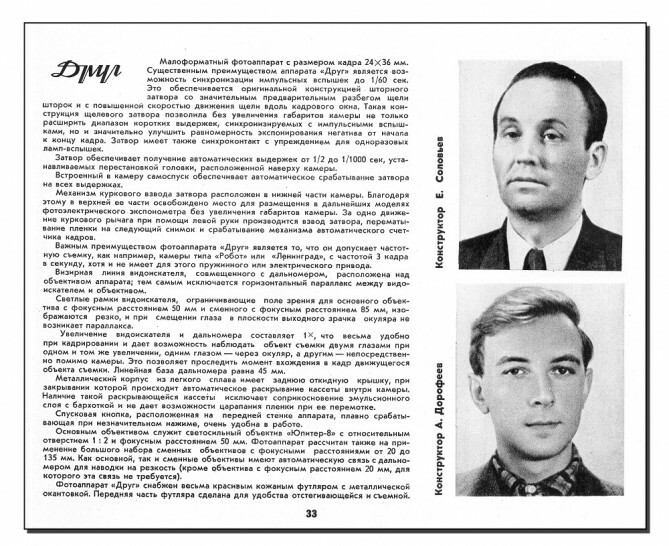 Camera #5800003 below from Vitaly Maleychuk (Belarus) collection. 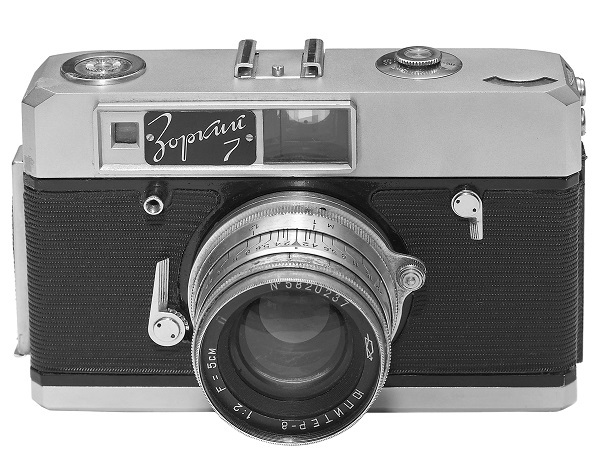 The productional version of Zorki-7 camera, released by KMZ in 1959-1962. The black vulcanite coverings as well, as horizontal-line leatherette coverings on some early samples (like on prototype Zorki-7 camera). Signally changed construction of the self-timer. 2 synchro contacts moved to the rear plate. Many other visual changes. An earliest so far known camera has s/n #5900066 (S.Pseunok coll.). An early camera Drug #5900352 with prototype Helios-65 2/50mm lens #000004! 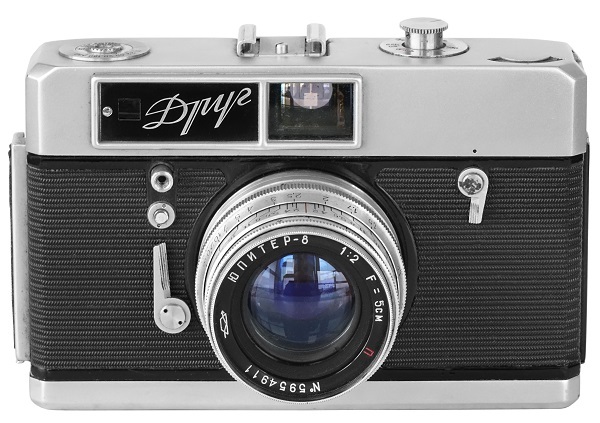 Camera identical to it's forerunner, but with selenium lightmeter incorporated. Very few samples released in 1960. An ultra rare to find camera. Camera #6000002 below from private collection in Russia.